When the clear-lens version of the Cuban Link Sunglasses first appeared on the internet, we knew we had to have them for our website!!! The Cuban Link Sunglasses with Clear Lenses are an absolute must for any fan of trill fashion. The dark-lens version are amazing, but the clear lenses paired with the thick frames and sleek contrasting arms make an absolute statement on your face. Dont' believe me? Try it out! Walk down the street or ride or the bus or train with these beauties and watch all eyes turn on you... because the Cuban Link Sunglasses with Clear Lenses are absolute head-turners! The Cuban Link Sunglasses with Clear Lenses are a mash-up of hipster and hip hop style - it really is the perfect marriage. They're the type of sunglasses Justin Beiber would wear!!! Seriously, though... love him or hate him, Justin Beiber has an amazing stylist! 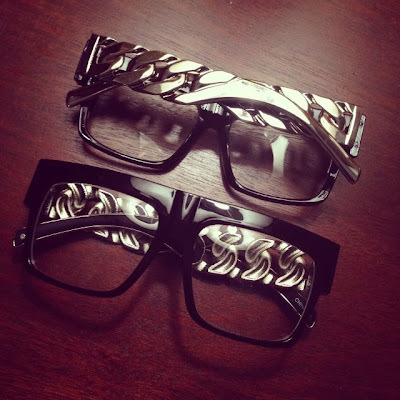 Get your pair of Cuban Link Sunglasses with Clear Lenses at RetroCitySunglasses.com.